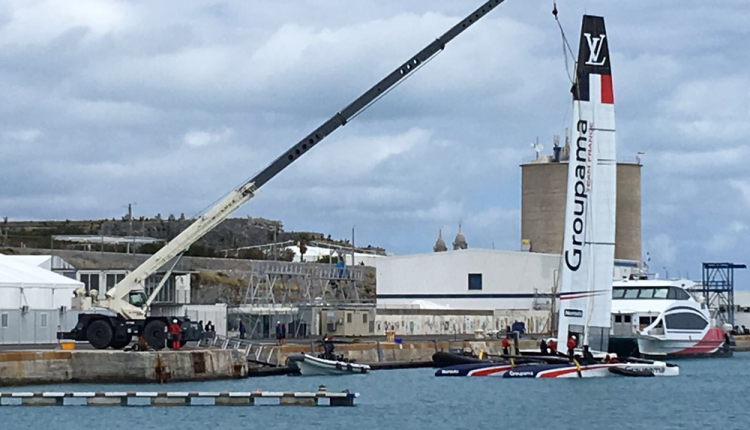 Empire Crane Company has cranes rented to Correia Construction Company Ltd. for lowering yachts into the water for the America’s Cup in Bermuda. Empire’s 2015 Terex HC110 lifted the yacht for Team Japan. Empire’s 2015 Terex RT780 lifted the yacht for Team France. Correia Construction decided to rent the cranes from Empire Crane because they’ve purchased cranes from Empire in the past, and the two companies have developed a great working relationship over the years. The 35th America’s Cup presented by Louis Vuitton will be held on May 26th – June 26th 2017. There will be teams competing from 6 countries, USA, who is defending the cup, Sweden, New Zealand, France, Britain, and Japan. Empire Crane Company purchased new Tadano Mantis Telescopic Boom Crawlers at ConExpo 2017, including the new GTC-800 and 15010 models. Yo Kakinuma, President & COO of Tadano America, Luke Lonergan, Vice President of Empire Crane, and Shiro Morita, Chief Operating Officer of Tadano America, celebrated the exchange made at ConExpo 2017. Empire Crane owners, Luke and Paul Lonergan are confident that the features in the new GTC-800 (such as the cutting edge OPTI-WIDTH™ and out-of-level charts) make the model a “definite winner” among the competition. This will position Empire Crane to better meet consumer requirements in the Northeast. Other features of the new GTC-800 include a five-section, 141.1-foot main boom, plus a 58.1-foot bi-fold jib. The crane has the capability to operate at up to four degrees out-of-level slopes up to 1.5 degrees and boasts the Tadano AML-C rated capacity indicator with OPTI-Width™ (allowing asymmetric track positioning in reduced width configurations) technology. The new 15010 has four-section main boom reaching heights of 111’6”, plus a 50-foot bi-fold jib. It also has Tadano’s AML-C rated capacity indicator system, uses Tadano Mantis’ improved performance swing system, and is approved for use in New York City.